We present work on vision based robotic grasping. The proposed method relies on extracting and representing the global contour of an object in a monocular image. A suitable grasp is then generated using a learning framework where prototypical grasping points are learned from several examples and then used on novel objects. For representation purposes, we apply the concept of shape context and for learning we use a supervised learning approach in which the classifier is trained with labeled synthetic images. 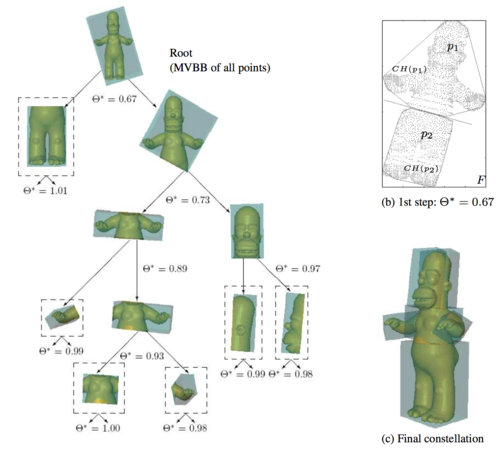 Our results show that a combination of a descriptor based on shape context with a non-linear classification algorithm leads to a stable detection of grasping points for a variety of objects. Furthermore, we will show how our representation supports the inference of a full grasp configuration. 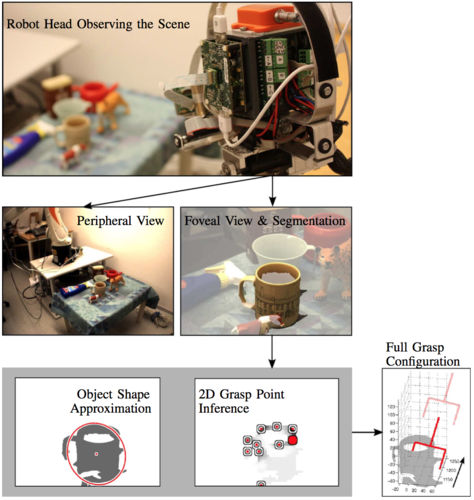 Bergström, N., Bohg, J., Kragic, D.
In this paper, we propose a method that generates grasping actions for novel objects based on visual input from a stereo camera. We are integrating two methods that are advantageous either in predicting how to grasp an object or where to apply a grasp. The first one reconstructs a wire frame object model through curve matching. Elementary grasping actions can be associated to parts of this model. The second method predicts grasping points in a 2D contour image of an object. By integrating the information from the two approaches, we can generate a sparse set of full grasp configurations that are of a good quality. We demonstrate our approach integrated in a vision system for complex shaped objects as well as in cluttered scenes. Bohg, J., Barck-Holst, C., Huebner, K., Ralph, M., Rasolzadeh, B., Song, D., Kragic, D.
A distinct property of robot vision systems is that they are embodied. Visual information is extracted for the purpose of moving in and interacting with the environment. Thus, different types of perception-action cycles need to be implemented and evaluated. In this paper, we study the problem of designing a vision system for the purpose of object grasping in everyday environments. This vision system is firstly targeted at the interaction with the world through recognition and grasping of objects and secondly at being an interface for the reasoning and planning module to the real world. The latter provides the vision system with a certain task that drives it and defines a specific context, i.e. search for or identify a certain object and analyze it for potential later manipulation. We deal with cases of: (i) known objects, (ii) objects similar to already known objects, and (iii) unknown objects. The perception-action cycle is connected to the reasoning system based on the idea of affordances. All three cases are also related to the state of the art and the terminology in the neuroscientific area. Recent advances on path integral stochastic optimal control , provide new insights in the optimal control of nonlinear stochastic systems which are linear in the controls, with state independent and time invariant control transition matrix. Under these assumptions, the Hamilton-Jacobi-Bellman (HJB) equation is formulated and linearized with the use of the logarithmic transformation of the optimal value function. The resulting HJB is a linear second order partial differential equation which is solved by an approximation based on the Feynman-Kac formula . In this work we review the theory of path integral control and derive the linearized HJB equation for systems with state dependent control transition matrix. In addition we derive the path integral formulation for the general class of systems with state dimensionality that is higher than the dimensionality of the controls. Furthermore, by means of a modified inverse dynamics controller, we apply path integral stochastic optimal control over the new control space. Simulations illustrate the theoretical results. Future developments and extensions are discussed. Kalakrishnan, M., Buchli, J., Pastor, P., Schaal, S.
We address the problem of foothold selection in robotic legged locomotion over very rough terrain. The difficulty of the problem we address here is comparable to that of human rock-climbing, where foot/hand-hold selection is one of the most critical aspects. Previous work in this domain typically involves defining a reward function over footholds as a weighted linear combination of terrain features. However, a significant amount of effort needs to be spent in designing these features in order to model more complex decision functions, and hand-tuning their weights is not a trivial task. We propose the use of terrain templates, which are discretized height maps of the terrain under a foothold on different length scales, as an alternative to manually designed features. We describe an algorithm that can simultaneously learn a small set of templates and a foothold ranking function using these templates, from expert-demonstrated footholds. 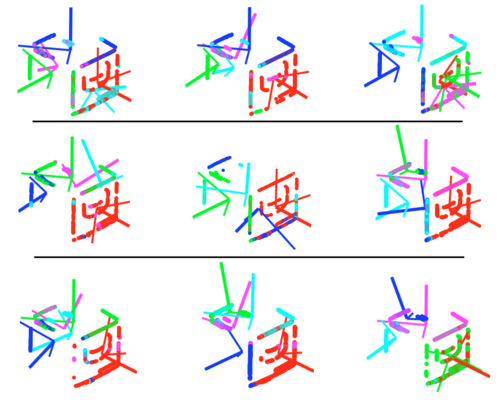 Using the LittleDog quadruped robot, we experimentally show that the use of terrain templates can produce complex ranking functions with higher performance than standard terrain features, and improved generalization to unseen terrain. Stulp, F., Oztop, E., Pastor, P., Beetz, M., Schaal, S.
over and over again. This regularity allows humans and robots to reuse existing solutions for known recurring tasks. We expect that reusing a set of standard solutions to solve similar tasks will facilitate the design and on-line adaptation of the control systems of robots operating in human environments. In this paper, we derive a set of standard solutions for reaching behavior from human motion data. We also derive stereotypical reaching trajectories for variations of the task, in which obstacles are present. These stereotypical trajectories are then compactly represented with Dynamic Movement Primitives. On the humanoid robot Sarcos CB, this approach leads to reproducible, predictable, and human-like reaching motions. Hoffmann, H., Theodorou, E., Schaal, S.
Many hypothesis on human movement generation have been cast into an optimization framework, implying that movements are adapted to optimize a single quantity, like, e.g., jerk, end-point variance, or control cost. However, we still do not understand how humans actually learn when given only a cost or reward feedback at the end of a movement. Such a reinforcement learning setting has been extensively explored theoretically in engineering and computer science, but in human movement control, hardly any experiment studied movement learning under reward feedback. We present experiments probing which computational strategies humans use to optimize a movement under a continuous reward function. We present two experimental paradigms. The first paradigm mimics a ball-hitting task. Subjects (n=12) sat in front of a computer screen and moved a stylus on a tablet towards an unknown target. This target was located on a line that the subjects had to cross. During the movement, visual feedback was suppressed. After the movement, a reward was displayed graphically as a colored bar. As reward, we used a Gaussian function of the distance between the target location and the point of line crossing. We chose such a function since in sensorimotor tasks, the cost or loss function that humans seem to represent is close to an inverted Gaussian function (Koerding and Wolpert 2004). The second paradigm mimics pocket billiards. On the same experimental setup as above, the computer screen displayed a pocket (two bars), a white disk, and a green disk. The goal was to hit with the white disk the green disk (as in a billiard collision), such that the green disk moved into the pocket. Subjects (n=8) manipulated with the stylus the white disk to effectively choose start point and movement direction. Reward feedback was implicitly given as hitting or missing the pocket with the green disk. In both paradigms, subjects increased the average reward over trials. The surprising result was that in these experiments, humans seem to prefer a strategy that uses a reward-weighted average over previous movements instead of gradient ascent. 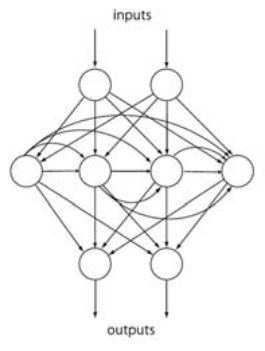 The literature on reinforcement learning is dominated by gradient-ascent methods. However, our computer simulations and theoretical analysis revealed that reward-weighted averaging is the more robust choice given the amount of movement variance observed in humans. Apparently, humans choose an optimization strategy that is suitable for their own movement variance. SL was originally developed as a Simulation Laboratory software package to allow creating complex rigid-body dynamics simulations with minimal development times. It was meant to complement a real-time robotics setup such that robot programs could first be debugged in simulation before trying them on the actual robot. For this purpose, the motor control setup of SL was copied from our experience with real-time robot setups with vxWorks (Windriver Systems, Inc.)Ñindeed, more than 90% of the code is identical to the actual robot software, as will be explained later in detail. As a result, SL is divided into three software components: 1) the generic code that is shared by the actual robot and the simulation, 2) the robot specific code, and 3) the simulation specific code. The robot specific code is tailored to the robotic environments that we have experienced over the years, in particular towards VME-based multi-processor real-time operating systems. The simulation specific code has all the components for OpenGL graphics simulations and mimics the robot multi-processor environment in simple C-code. Importantly, SL can be used stand-alone for creating graphics an-imationsÑthe heritage from real-time robotics does not restrict the complexity of possible simulations. This technical report describes SL in detail and can serve as a manual for new users of SL. SL was originally developed as a Simulation Laboratory software package to allow creating complex rigid-body dynamics simulations with minimal development times. It was meant to complement a real-time robotics setup such that robot programs could first be debugged in simulation before trying them on the actual robot. For this purpose, the motor control setup of SL was copied from our experience with real-time robot setups with vxWorks (Windriver Systems, Inc.)â? ?indeed, more than 90% of the code is identical to the actual robot software, as will be explained later in detail. As a result, SL is divided into three software components: 1) the generic code that is shared by the actual robot and the simulation, 2) the robot specific code, and 3) the simulation specific code. The robot specific code is tailored to the robotic environments that we have experienced over the years, in particular towards VME-based multi-processor real-time operating systems. The simulation specific code has all the components for OpenGL graphics simulations and mimics the robot multi-processor environment in simple C-code. Importantly, SL can be used stand-alone for creating graphics an-imationsâ? ?the heritage from real-time robotics does not restrict the complexity of possible simulations. This technical report describes SL in detail and can serve as a manual for new users of SL. Pastor, P., Hoffmann, H., Asfour, T., Schaal, S.
We provide a general approach for learning robotic motor skills from human demonstration. To represent an observed movement, a non-linear differential equation is learned such that it reproduces this movement. Based on this representation, we build a library of movements by labeling each recorded movement according to task and context (e.g., grasping, placing, and releasing). Our differential equation is formulated such that generalization can be achieved simply by adapting a start and a goal parameter in the equation to the desired position values of a movement. For object manipulation, we present how our framework extends to the control of gripper orientation and finger position. The feasibility of our approach is demonstrated in simulation as well as on a real robot. The robot learned a pick-and-place operation and a water-serving task and could generalize these tasks to novel situations. Buchli, J., Kalakrishnan, M., Mistry, M., Pastor, P., Schaal, S.
Many critical elements for statically stable walking for legged robots have been known for a long time, including stability criteria based on support polygons, good foothold selection, recovery strategies to name a few. All these criteria have to be accounted for in the planning as well as the control phase. Most legged robots usually employ high gain position control, which means that it is crucially important that the planned reference trajectories are a good match for the actual terrain, and that tracking is accurate. Such an approach leads to conservative controllers, i.e. relatively low speed, ground speed matching, etc. Not surprisingly such controllers are not very robust - they are not suited for the real world use outside of the laboratory where the knowledge of the world is limited and error prone. Thus, to achieve robust robotic locomotion in the archetypical domain of legged systems, namely complex rough terrain, where the size of the obstacles are in the order of leg length, additional elements are required. A possible solution to improve the robustness of legged locomotion is to maximize the compliance of the controller. While compliance is trivially achieved by reduced feedback gains, for terrain requiring precise foot placement (e.g. climbing rocks, walking over pegs or cracks) compliance cannot be introduced at the cost of inferior tracking. Thus, model-based control and - in contrast to passive dynamic walkers - active balance control is required. To achieve these objectives, in this paper we add two crucial elements to legged locomotion, i.e., floating-base inverse dynamics control and predictive force control, and we show that these elements increase robustness in face of unknown and unanticipated perturbations (e.g. obstacles). Furthermore, we introduce a novel line-based COG trajectory planner, which yields a simpler algorithm than traditional polygon based methods and creates the appropriate input to our control system.We show results from bot- h simulation and real world of a robotic dog walking over non-perceived obstacles and rocky terrain. The results prove the effectivity of the inverse dynamics/force controller. The presented results show that we have all elements needed for robust all-terrain locomotion, which should also generalize to other legged systems, e.g., humanoid robots. Mistry, M., Schaal, S., Yamane, K.
Recently, several controllers have been proposed for humanoid robots which rely on full-body dynamic models. The estimation of inertial parameters from data is a critical component for obtaining accurate models for control. However, floating base systems, such as humanoid robots, incur added challenges to this task (e.g. contact forces must be measured, contact states can change, etc.) In this work, we outline a theoretical framework for whole body inertial parameter estimation, including the unactuated floating base. Using a least squares minimization approach, conducted within the nullspace of unmeasured degrees of freedom, we are able to use a partial force sensor set for full-body estimation, e.g. using only joint torque sensors, allowing for estimation when contact force measurement is unavailable or unreliable (e.g. due to slipping, rolling contacts, etc.). We also propose how to determine the theoretical minimum force sensor set for full body estimation, and discuss the practical limitations of doing so.